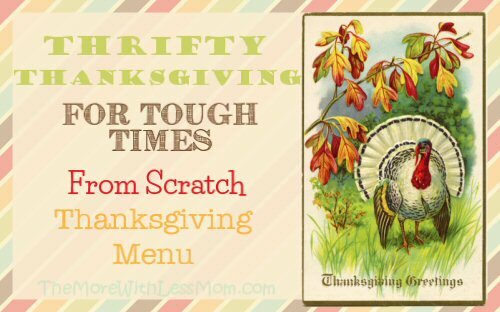 This is a frugal, from scratch Thanksgiving menu with details on costs, to help you make smart decisions in tough times. This is my menu that came from my $50 shopping cart, assuming your cupboards are bare, but I was very conservative in my estimating, so odds are very good that you can do better than this and include more. You have to decide what is most important to your family for your Thanksgiving menu. I love fall flavors. Everything we eat at Thanksgiving is my favorite; I look forward to the meal all year. In my house we have to have turkey, gravy, stuffing, pumpkin pie, and egg nog. The priority of this list was determined by my hubby, and may or may not have anything to do with what your family likes. You will note how I had to dig down in the list to find something that would fit my last little bit of money. I do include that last item on the list so I know what I want to do if something comes out better than I expected. The price listed is the actual cost to make it. This is a deceptive total for everything, since it is calculated from the actual ingredients used. Most people don’t have to buy pantry items like milk, flour, vegetable oil and butter to cook their meal, so it does not cost as much.